Bryan Christy's The Lizard King Book » Blog Archive » Vegas, Baby! One of the great delights of writing a book is the way it acts as a kind of shout into the wilderness of one’s life, and it is great fun to hear the echo return in emails and letters from childhood friends, former teachers, colleagues, an old girlfriend or two (even one who dumped me for god’s sake). I got one yesterday from a friend who is married, has a daughter, and has moved to Las Vegas since we last communicated. 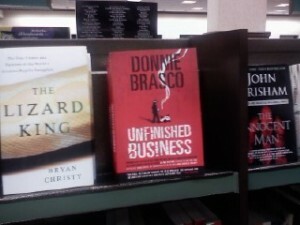 He included this photo from the top shelf of his local Barnes and Noble true crime section. It’s a small thing, taking a photo on a cellphone in a bookstore, and yet it’s not a small thing at all. This entry was posted on Thursday, December 11th, 2008 at 12:48 am	and is filed under Book News, Uncategorized. You can follow any responses to this entry through the RSS 2.0 feed. Both comments and pings are currently closed.